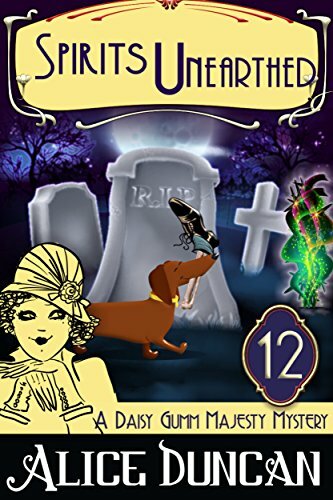 The 12th book of the Daisy Gumm Majesty series is an amusing visit to the 1920’s. I noted a few editing problems and it did not take away my enjoyment of the book. Daisy and Sam Rotondo, her fiance are in the cemetery looking for their decrease spouses grave. Spike, Daisy’s dachshund bring them a boot that has a leg attached to it. They find the body of an unpopular doctor. The evidence points towards his estranged daughter and her husband. Rolly, Daisy’s spiritual guide informed everyone in a seance “to look to the family”. Daisy is looking hard for evidence to clear the daughter, will she succeed? I HIGHLY RECOMMEND this book and series. Aunt Vi recipe for Swedish Southern Chicken is included. This entry was posted in Books, TBR PILE, Uncategorized and tagged abortion, Alice Duncan, cozy mystery, Daisy, Favorite, music, violence. Bookmark the permalink.